Despite the large amount of time I have spent on a bicycle, I have never figured out exactly what makes me equate the experience with freedom. My first answer would be that it is due to the increased mobility that I suddenly acquire, but with further thought, I think that it’s more likely to be the open air rushing past my ears, filling the gaps in between thoughts. It’s different everywhere, and I love it everywhere. In India, the crash of the wind is intertwined with the noisy honks of tuk-tuks and the countless calls of the coconut vendors. In Cape Cod, the honks of tuk-tuks are more likely to be the screeches of seagulls; in New York, the rumble of the subways. While enrolled at THINK Global School, students are encouraged to be creative during the course of their studies and travels. When the students document these thoughts, we are often delighted with the results. In “36 hours in Hampi,” 10th grade student Madeline S. brings the lively sights and sounds of Hampi, India to life through incredibly descriptive travel writing. I felt as if I came alive for the first time this weekend in Hampi when we set off through the streets on our multicolored bicycles. My bulky fuchsia bike did not seem to be suited to the task, but again and again, with a lot of careful maneuvering, we made it up the intimidating hills and coasted down into the oncoming traffic and through the zigzag routes of the tuk-tuks and the goats until we arrived at the next monument. The monuments were mostly temples that could no longer be worshipped at because parts of the statues had been broken off. However, it was still possible to feel the mystical atmosphere that once enveloped the temples due to the sweet smell of burning incense and the detailed carvings covering the walls. At the same time, the mystique of the Hindu temples held a distinctly human feel which was very different from the feelings I have had in Christian cathedrals. To give you a little context, I am not religious at all, so, for the most part, visiting religious sites is an objective experience for me. The architecture in cathedrals and basilicas is astounding and very detailed, similar to that of the Hindu temples. There is something about the architecture in cathedrals that makes me feel awe and intimidation, as if the cathedral could have only been built by a higher power. To me, that is representative of the aim of the religion. In the same way, I feel as if the Hindu temples tie together humanity and godliness instead of turning the gods into something to fear. The gods in the Hindu stories have their flaws, just as humans do, making them more accessible. Although the architecture in the Hindu temples is astonishingly intricate, my first thoughts go to the humans that spent time creating such beauty, not to a god or multiple gods. I don’t know if I can really say whether that is the aim of the religion or not, as Hinduism is extremely complex. What I can say with conviction is that the aura of the temples was very different from that of the cathedrals I had been to before. 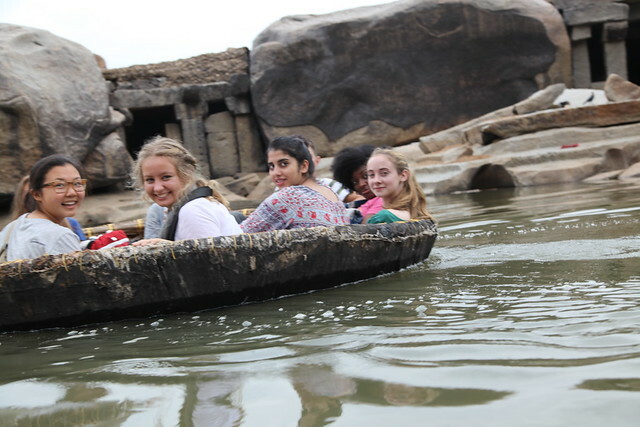 Towards the end of the day, we climbed aboard coconut-shaped boats and floated down the Tungabhadra River, surrounded by craggy rock formations framed by a tranquil blue-grey sky. For one moment, everything seemed perfect. I couldn’t remember ever being as happy as I was then, and I couldn’t imagine ever being happier. It felt as if this was exactly what I had been looking for this whole time in terms of adventure and just what I felt I was missing in general. Of course the moment was fleeting, but if we pretend to see time the way Kurt Vonnegut’s Tralfamadorians do — as an expanse somewhat like a range of mountains –judfr the moment still exists in its perfection and always will.